Fire hydrant system with semi-rigid hose is a very effective fire-fighting facility with an uninterrupted supply of water immediately. Approved to ČSN 73 0873 and ČSN EN 671-1. 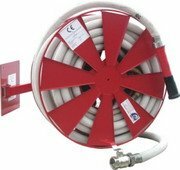 Fire hydrant system with semi-rigid hose is a very effective fire-fighting facility with an uninterrupted supply of water immediately It is especially beneficial where large amount of water up to 200 litre/min is required. See the Specifications table below. Steel hydrant cabinet is designed for wall or recess mounting. To facilitate pressure-water supply into the system, the cabinet is equipped with two knock-out holes at the top and bottom of both side walls of the cabinet. Dimensions of hydrant cabinet made of 1 mm steel sheet – 800x800x340mm. Its surface is textured, coated with RAL 3000 (red) or RAL 9016 (white) tint powder for indoor applications. Hose-reel is mounted on a swinging arm. It consists of two side discs reinforced with wire of 8mm diameter. Standard reel dimensions – 658mm diameter, 216mm width. D33 semi-rigid hose is manufactured by Pavlis a Hartmann under trade name PH – stabil - D33. Hose length is 20 or 30m. Tajfun Turbo spray nozzle (equivalent to 13 mm) with a revolving head. D33 connection hose of 1.5m length with ball valve 5/4” PN30 DN32. 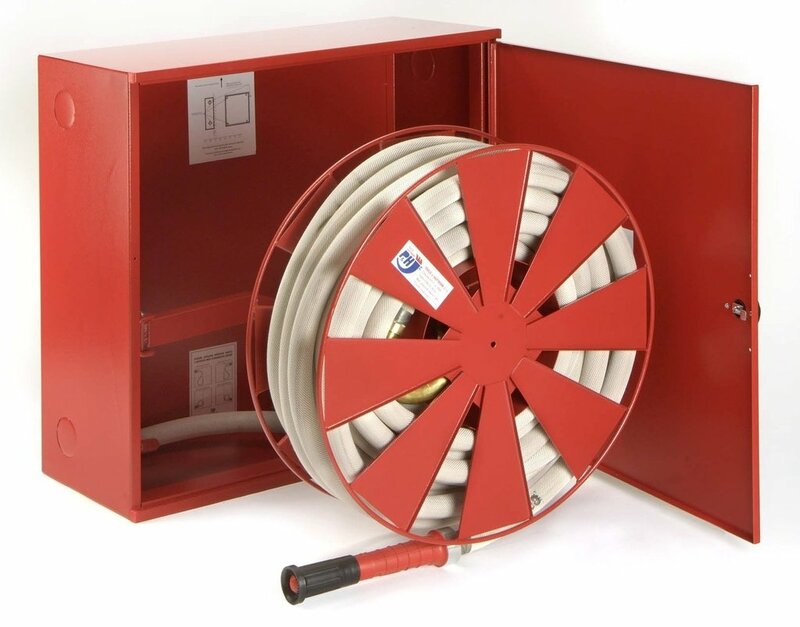 The hydrant reel can be installed on a wall independently without the cabinet using a steel bracket (see the picture), or the arm holder can be welded onto a steel structure. We recommend mounting the steel bracket on a wall with 4 steel screws, at least 8 mm in diameter. Hose systems are to be installed at the height betw. 1.1 and 1.3 m above the floor (measured to the centre of equipment). This system is designed for indoor frost-free applications.